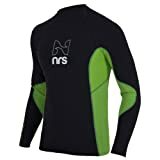 The NRS Men's HydroSkin 0. 5mm Long-Sleeve Shirt is thin enough for chilly paddle sessions in the summer, but it also gives you more warmth without the restrictions when you pair it with another layer in other seasons. The PowerSpan exterior provides a four-way stretch so you can paddle like you were shirtless, and the ThermalPlush lining warms your body with fleecy softness while the titanium layer reflects your body heat back to you for even more warmth. The neoprene core is super-thin to keep you dry without feeling bulky, and H2Core underarms ensure the breathability you need to push your paddling to the extreme.